Byzantine Empire, also known as Eastern Roman Empire, ruled the area of comprising present-day Turkey for more than one thousand years (330 – 1453 CE). As an empire living such a long time in this geography would develop a rich food culture. And yet, Byzantine cuisine has been a mystery for scholars, cooks, and the general public, because cookbooks surviving from the Byzantines are very rare. Regarding the Byzantine cuisine and dining tradition, scholars usually make deductions with the help of written sources and works of art such as, paintings, icons, frescoes, and so on. In this post, we would like to introduce you Byzantine cuisine and dining tradition of the Byzantines. According to our research, the Byzantine cuisine was Mediterranean-centric meaning it was made up mainly from cereals, olives, vegetables, sea food, pulses, grains, wild greens, and fruits. Unfortunately, most of the population were not lucky enough to get a hold of such ingredients, let alone consume them. Instead, bread was the food of the people and thus, essential for the Byzantines. There were different types of breads such as artos (freshly baked white bread), paximadia (long-lasting hard bread), and traganos (porridge). According to Andrew Dalby, olives and olive oil were other essential ingredients of the Byzantines. In fact, they made up nearly one third of the total dietary intake of one person. 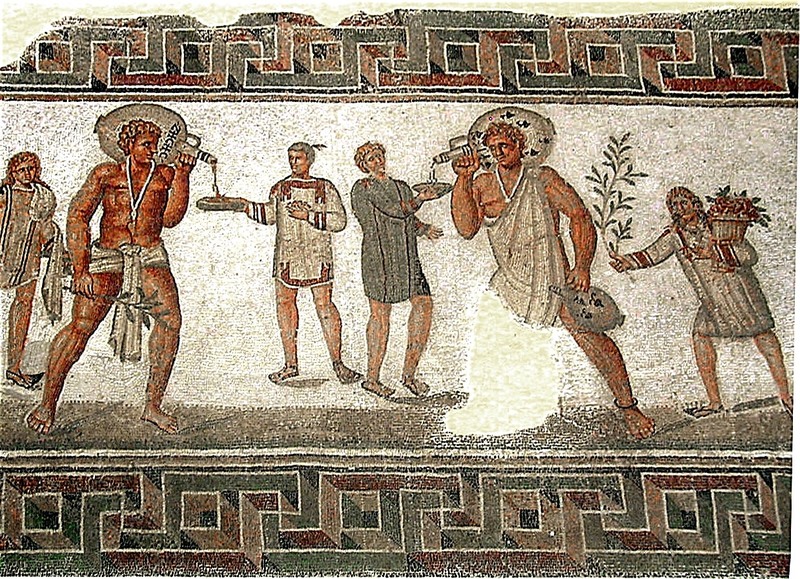 Much like today, the Aegean and Mediterranean coasts of the empire were major production centers of olives and olive oil. An interesting fact was the consumption of animal products which was limited, excluding sea food, which was readily available. This was because eating animals was a luxury. In terms of meat, Byzantine cuisine was made up of mainly pork and sheep rather than – today’s preferred – beef and chicken. How about the cuisine of Constantinople? “What did Constantinopolitans eat?” cannot be answered with a sentence or paragraph. Constantinople (Byzantine Istanbul) was even more complicated and different. Throughout the Middle Ages, Constantinople was one of the most important port-cities; it was the connection the Black Sea and the Mediterranean Sea. In addition, city itself is a bridge between Europe and Asia. Therefore, there were many demographics in the city that brought their own cuisine with them. Constantinopolitans would distribute and consume Balkan, Anatolian, Black Sea, Aegean, Persian, and many other civilizations’ ingredient. 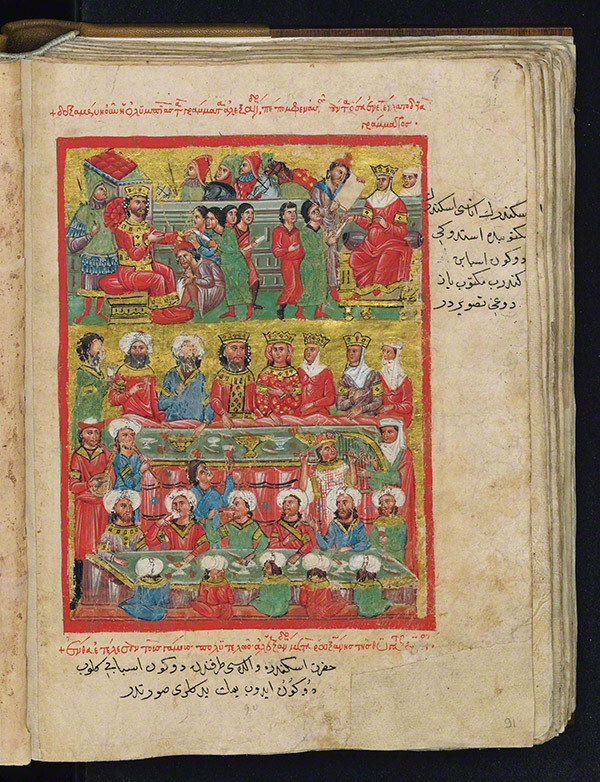 In short, Constantinople cuisine was a huge mix of different cuisines. However, we know from both primary sources and works of art that one of the favorite meals of Constantinopolitan elites’ was cephalos (mullet) found abundantly in Constantinople’s very own sea, the Marmara Sea. 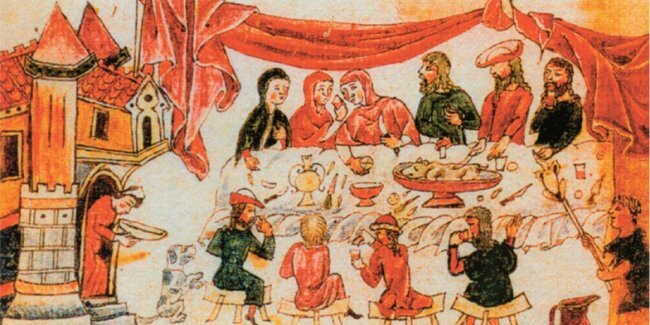 Wine was the main drink of choice that accompanied most Byzantine meals and there were various quality of wine, too. Although the lands that Byzantine empire controlled (Balkans, Cappadocia, Eastern Anatolia, Aegean coast, Peleponnese etc.) – very suitable for winemaking – the latest research of Ilias Anognostakis shows that most of the wines were produced throughout the Aegean islands such as Crete, Samos, Lesbos, Tenedos, and many others, which are still wine production centers. How many meals were Byzantines were having in a day? Byzantines ate two meals during the day: ariston (light breakfast) and deipnon (main meal) served toward evening. Some primary sources also mention prophagion (light meal taken at dawn). 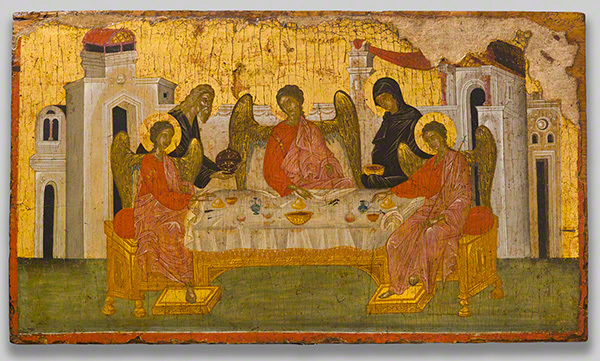 Visual sources show that contrary to Near Eastern traditions, the Byzantines sat on benches or chairs gathered around a rectangular table. First, opsa (small portions of appetizers) and then main meal were served. Various utensils such as spoons, knives, individual bowls, and even forks were available. The Byzantine invented table fork! According to St. Peter Damian, who lived in the 10th century CE, Theophanu Skleros, the Byzantine wife of Otto II, introduced table fork for the first time at a banquet she hosted in 972 CE. Her western hosts astonished with the utensil that by the 11th century the table fork was a common table accessory in the west. For more information on Byzantine cuisine and dining tradition I recommend you to read Andrew Dalby’s “Tastes of Byzantium” book. In addition, for an example of Byzantine dinner menu you can read Aylin Öney Tan’s article that was published last week. Please feel free to contribute to our article and share your stories with us.